While I wholeheartedly agree that an accomplished aesthetician can work magic on your skin, not everyone has the luxury of time or money to visit a spa every month (I wish!) — or even bimonthly or quarterly. But, everyone can carve out an hour in the week to treat and pamper her skin at home. With the right potions, we can all have a mini spa experience from the comfort of our couches. If you’re clumsy when it comes to DIY — or need just something to prompt you to get your spa time on weekly, bi-weekly or monthly — it’s time for you to say hello to Huckleberry. Does that sound familiar, green beauty junkies? In an effort to curb our product hoarding, Huckleberry operates on the premise that busy product junkies will actually use the fresh, results-driven masks and exfoliants Huckleberry delivers for your weekly / bi-weekly / monthly spa-at-home time (depending on your preference). 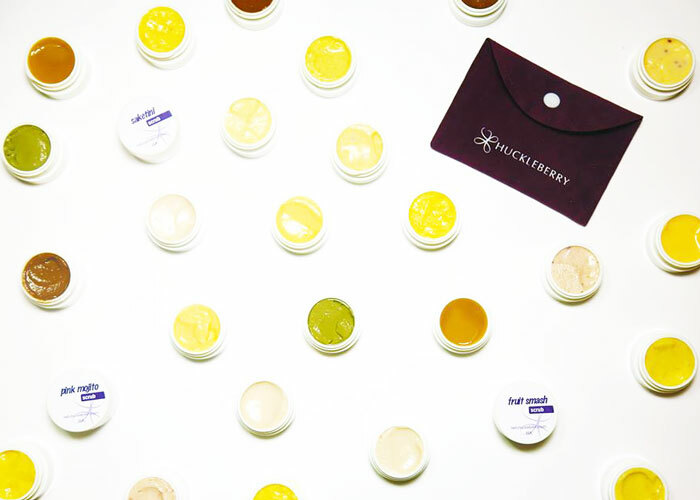 To get started with Huckleberry, you simply take a skin quiz, create an account and then peruse the mask and exfoliation sets customized to treat your skin’s key issues. Pick the products that seem like a great fit for you and then add them to your treatment menu. Feel free to choose what really speaks to you, even if it’s not in your “recommended products” list. Case in point: Huckleberry has a “Jasmine” treatment as part of its “Maintain Me” product collection that’s geared toward normal/combination skin that has hyperpigmentation issues. While I’m more combination/oily, I do deal with some hyperpigmentation around my nose and chin, and I must have all the jasmine things. Done and done. The Huckleberry “Jasmine” treatment can easily be integrated into your current skincare regimen. After cleansing, apply and massage the peel onto damp skin to stimulate blood flow. Leave the peel on for 10 minutes (if it’s too intense, try 7-8 minutes instead) and then rinse off with warm water. If you’ve tried acid peels in the past (think Juice Beauty’s Green Apple Peel or any other acid-based peel), this will be familiar. If you haven’t, expect some mild tingling (seriously, 5% glycolic acid isn’t that much … remember my 20% salicylic acid peel?!) and possibly some flush to your skin. Always, always, always patch test, though, to ensure your skin isn’t going to react dramatically! Post-peel, apply the treatment mask for 10-15 minutes to further brighten and tone the skin thanks to its heavy dose of citrus fruits, white willow bark (so good for acne-prone skin!) and flower extracts. After this weekly treatment, my skin looked and felt brighter and more even toned. However, I did experience some flaking, thanks to the glycolic acid peel. That’s a good thing though — acid exfoliation at work! It was nothing like my supercharged salicylic peel that I’ve told you about before, but it was noticeable around my nose. Once the natural exfoliation process was finished, my skin truly looked better. A weekly low-percentage glycolic acid treatment is something that my perpetually congested skin takes so well to — be it via peels or toning pads. I’m a fan. So, though this is a “Jasmine” treatment set, I actually don’t see one mention of the precious flower in the ingredients list. Huh? Perhaps a more accurate name would be “Floral” or something like that, because it is a pleasant, toned-down flower-citrus scent. Despite this somewhat misleading name (seriously, am I missing something here? ), I still enjoyed the “Jasmine” treatment (as well as “Sunrise“), and love the concept of Huckleberry: Fresh, regular, one-time-use facials delivered to your door for the busy beauty who hoards a little too much product. How often do you go to a facialist? How often do you mask at home? What do you use? What do you think of a delivery service like Huckleberry? Tell me in the comments!